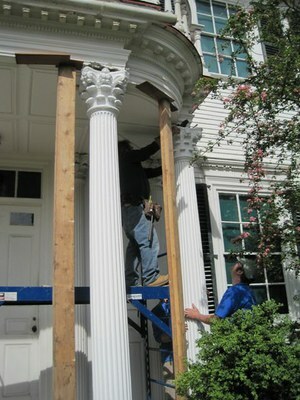 After nearly a year’s absence for preservation work, four fluted columns with Corinthian capitals have been returned to the Governor John Langdon House. The columns, part of the original portico construction of the 1784 Georgian mansion, have been attributed to joiner Ebenezer Dearing, a well known Portsmouth housewright. The Historic New England carpentry crew took on the enormous project of stripping the columns, and even decided to investigate one of the complex capitals. What they found under approximately fifteen layers of paint are fine carvings that were not obvious through the many paint layers. Now returned to the house, the four fluted columns have been stripped and repainted, new bases have been turned, and new plinth boxes are holding up the whole construction. Visitors to the Langdon House this summer will see one capital the way it was designed to look, and hasn’t been seen for decades.